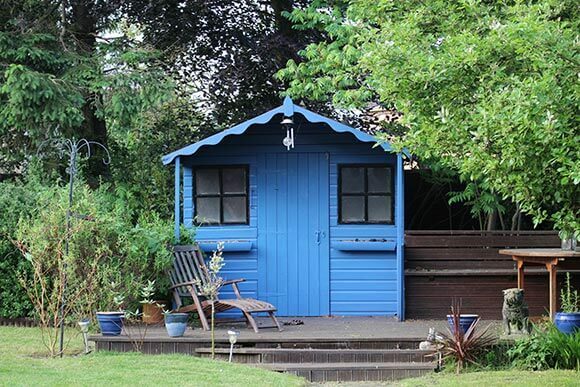 With a spectrum of wood tones, pastel shades and vibrant colours to choose from, changing the appearance of a garden shed has never been easier. Whether looking to highlight shed window and door frames or go for the full beach hut look, our shed paint guide will help you to decide. By definition, a paint coats and colours a surface with an opaque finish. When it comes to shed paint, things aren’t as clear cut. Although traditional exterior wood paints have been known to crack, flake and peel, newer garden paint formulas are more flexible and resistant to weathering. They move with the wood as it expands and contracts with temperature and moisture to retain the seal over the shed. Many exterior wood paints or garden paints suitable for wooden sheds and summerhouses now offer guarantees of up to 6, 8 or 10 years. The term ‘shed paint’ is sometimes confused with other wood care products that stain sheds, usually to brown wood tone colours or greens such as shed preservers, shed stains and other oil-based shed treatments. Which is the best shed paint to use? Many products labelled as garden wood of shed paints are actually wood stains. This is great as rather than coating the wood, they stain it meaning that it will not crack, peel or flake over time. To maintain the look, a fresh coat can be applied every 2 or 3 years or as an when required to refresh the finish. Deciding on which is the best shed paint largely depends on individual preferences on colour, type of finish and maintenance expectations as well as budget. The following are some of the most popular shed paints on the market, all of which offer a different range of colours and finishes. Ideally, the best time to paint a garden shed is when it is new and when the weather is fair, ideally spring or summer. New sheds can be treated with a clear wood preservative prior to painting. If done before the shed is constructed, the ends of the shed panels can also be treated providing better long term protection for the shed. If using a wood or shed preservative prior to painting, ensure that the correct type is used. For water-based shed paints, ensure that the preservative does not include wax, oil or silicon. If painting with an oil-based stain or paint then preservers that contain wax are fine. Old sheds must be clean, dry and free from surface contaminates prior to painting. Any traces of mould, algae, green or black staining on the timber must be cleaned and treated prior to painting. Need to know more about the full range of shed treatments? Read our guide on shed treatments here.